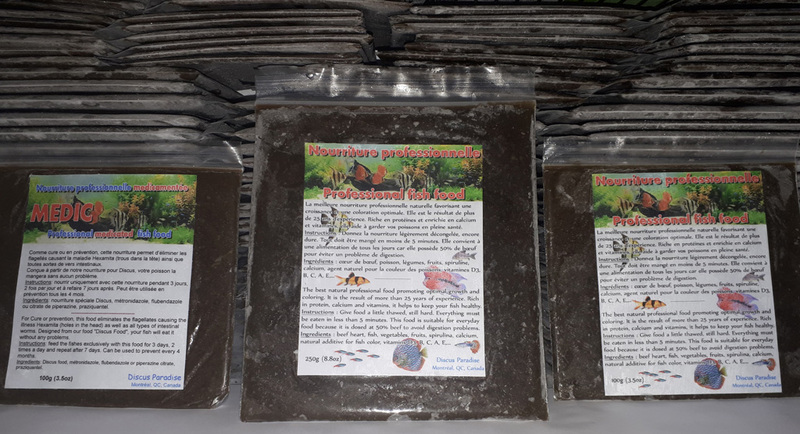 Professionnal enriched frozen food for Discus and other fishes. On this video you will see that the Discus love it, that the consistency of our food keeps it compact in the water and it even suitable for small Discus, like here with the 2.5 “. The food can be pick-up by appointment at H1A 2B1 or at a reseler. For delivery, please contact us. As cure or prevention, this food helps eliminate flagellate causing Hexamita disease (holes in the head) and all kinds of intestinal worms. 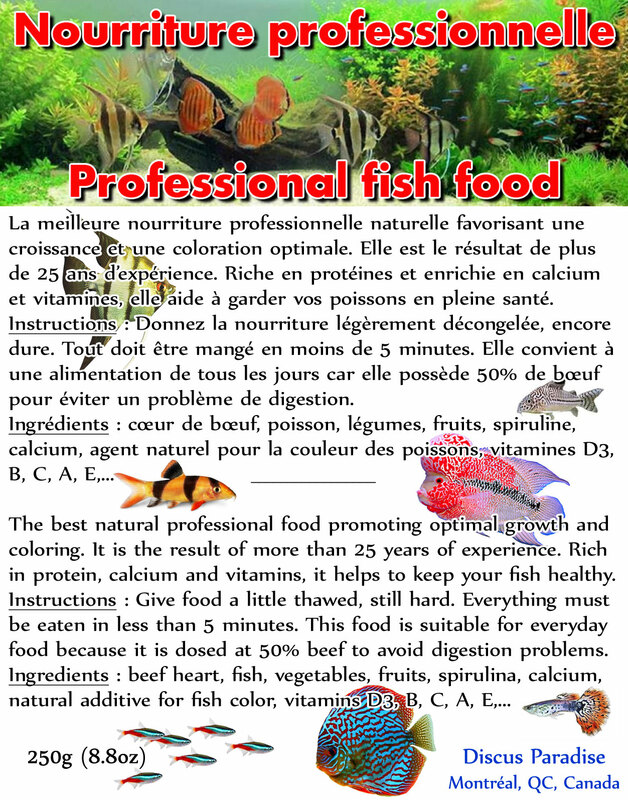 Designed from our food for discus, your fish will eat it without any problems. Instructions: only feed with this food for 3 days, 2 times a day and again 7 days after. Can be used in prevention every 4 months. Ingrédients: Discus food, metronidazole, citrate de piperazine, praziquantel. Despite the production in large quantities of this food, we take great care in its design and foods that compose it. Beef heart is fully cleaned to remove fat and veins, leaving only the meat. Indeed, it is the same food that we use for our Discus, hence the desire to make the best possible. – 6.5 to 12 cm, about 2.5-5 grams per meal, so 7.5-15 grams a day. – 12-18 cm, about 5-7.5 grams per meal, so 15-22.5 grams a day. If it is not possible to provide frozen food because you are too far or if you want to choose your own ingredients to make a fish recipe without meat for example, we propose to make your own food . You will receive the recipe and explanations as well as any supplements to 1 kg of food to make your best recipe! You just have to buy your meat, fish, shrimp, vegetables and fruits. You will simply need a conventional kitchen mixer as long as your beef heart meat is already hashed. For the non-ground meat, you will need a grinder or food processor. You can see instruction here. We especially studied the best supplements to achieve the best results. They are much more important than what we imagine. In nature, the Discus eat prey that bring them much more than just protein. Because they are alive, they prey enjoy most important vitamins and because they are entire (small fish, for example), they contain more calcium than fish flesh of your recipe. You should know that a misuse, supplements can be harmful in the long term creating problems liver and kidneys. We do not use vitamins for humans as the Centrum brand or some other advise you that do not match the needs of Discus. We make our own mixture from different high quality ingredients. – Natural ingredient to increase discus color.